I author a lot of documents, and when it’s time to save them, I generally need to save them on our server. In fact, 90% of my documents end up in a shared drive. Currently, when I go to save my Word document (or any other Office Doc I’m working on), I have to navigate from the defaults Document folder and scroll to the server I want to save to. It’s really a waste of time to do that every time you save a doc, so here’s a quick time saver tip when you generally save somewhere besides the default location. Locate the Default local file location and find your new default folder. Stay tuned for other quick tip Office time savers! 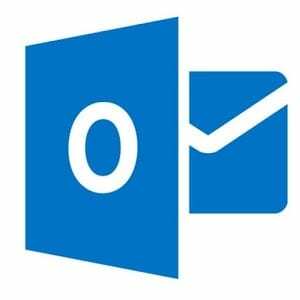 In my prior post, I talked about setting alerts in Outlook for those critical emails that you need to respond to right away. However, the messages that rank high in the importance category and require some phone calls or research before I can respond need a different approach. I need those types of messages to stand out in my inbox as a visual reminder of their importance, and for me it’s also a kick in the pants that I better not drop the ball on this one – especially, when it comes to prompt customer service. Notice in the above pic, you’ll see unread email in the standard blue font and then one in a bold green font. I changed my formatting, so every time I get an email from a specific email account, it stands out with that font. You can specify conditional formatting to occur from specific individuals, when certain keywords are used, etc. Will conditional formatting solve my problems for not missing an email again? Probably not, but between this and setting alerts, I’m hopeful it will keep me more organized and lessen my chances of eating humble pie once again! I’m constantly looking for tips on how to work more efficiently in Microsoft. The Office suite is so powerful that I’m pretty sure we underutilize the resources at our fingertips. If you’re struggling with the “I want to learn, but I don’t have time…” sentiment consider sharpening your skills in 15 minute bites. A couple of weeks ago, I stumbled on Microsoft’s Tuesday morning webinar series and was perusing through their archives. You can join their webinars live or watch at your own convenience. You can view upcoming Office webinars here. 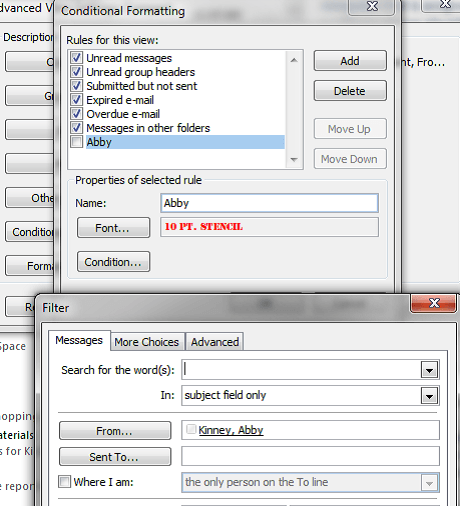 Got your own Microsoft Office tip you’d like to share? Let us know at ittraining@smu.edu and we’ll be sure to pass it on! After finals it’s time to catch up on some sleep! Have you pulled a few all nighters trying to cram for exams? Now that the semester is winding down you can use this app to track your sleeping patterns and see if you’re using your time off from school wisely. What’s behind the Excel Design tab? 5 tips worth knowing. If you’ve been working with Excel for a while, my guess is that you are probably somewhat familiar with the basics of converting your data into a table. However, you may not be aware of some of the features behind the Design tab. The Design tab will display anytime you click in a table. Here are 5 handy tips worth knowing. I will review them from right to left. When you click on the drop down in the Table styles options you’ll see an assortment of Table Styles available to suit your preferences. If there is a table style you like and you want to add additional customization you can do so by selecting a feature in the Table Style Options section. I often choose to have items displayed with banded rows (every other row shaded), but sometimes it might be easier on the eye to have banded columns. Selecting the Total Row not only adds a total line to your table, but it also has built in functions that you can toggle to further analyze specific data. Did you know you could add a slicer to filter through data? Select Slicer, next select what column you want to filter. 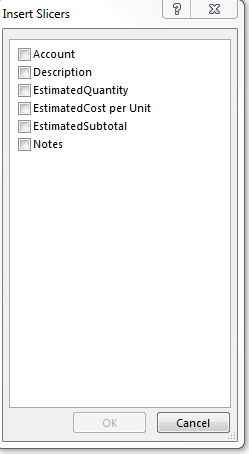 In my example, I wanted to view specific types of charges, so I chose the account columns to filter. Next, select the item you want to filter and the results will be displayed. 5. Selecting the Remove Duplicates button will allow you to delete duplicate values. You’ll simply need to tell Excel what column you want the duplicates to be removed from. Oh and by the way, if you remove duplicates from the wrong column, don’t forget the handy Ctrl+Z function to undo your last action! To learn more Excel tips, check out one of my Basic Formula workshops or Rachel Mulry’s Advanced Excel training. Got a pic? Send a Postagram! Last week my buddy Ian provided some practical tips for using Instagram. To follow up with his theme I thought I’d share an idea of what you can do with a pic once you have it looking the way you want. My husband recently took this selfie of us, he edited the photo to give us the glasses, and then posted it online. I liked it so much that I wanted to make a card out of it to surprise a dear college friend, so she would know I hadn’t actually forgotten her birthday. Below is my “Here’s celebrating you!” birthday postcard. Truth be told, I’m lousy at taking the time to shop and send cards, but this was so quick, easy and fun that I had to do it. 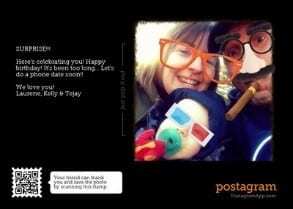 Postagram allows you to send your photos as real postcards. And let’s face it, in this day and age with technology and social media taking over, every once in a while you want to get some fun snail mail! So, if you’re getting ready for that next vacation or spring break trip, why not use one of your own photos as a postcard? You can download the app (available on android or iphone) or upload photos to the postagram. Photos need to be .PNG, .JPG or .GIF , should be at least 612 x 612, and can’t exceed 8MB. If you are using the app, simply select your photo or login to Instagram, Facebook, or Dropbox to get your pic. 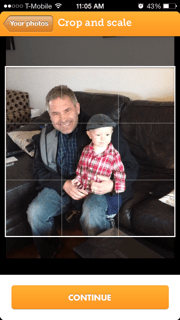 Then, crop and scale your photo and hit continue. Finally, personalize your postcard message and click continue. Once you do, you’ll be directed to your contacts. You can select a recipient from your address book or enter a new address if needed. I guarantee you, send one of these and you’ll make someone very happy! By the way, while I’m talking about taking and posting pics, consider sending us your favorite Valentine themed SMU pic @smuoit in our Valentine photo contest. We’d love to see who and what you love at SMU! No matter how many times I organize my inbox I somehow manage to get to the point of needing to reorganize it. In many of my trainings, I’m often asked for tips on how to make sure one doesn’t miss an email from key individuals or contain keywords. Here’s a tip I’ve found handy. If you are like me, there are probably certain emails that you receive that rank in priority for replies. Maybe it’s from your professor, supervisor, or about a critical project. In any case, I recommend setting alerts on emails that are sent from key partners or contain keywords. You can customize your alert to notify you by playing a specific sound, marking your email with high importance, or even displaying the email in an alert window. 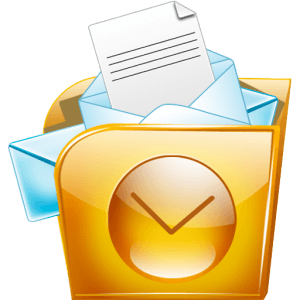 So, no matter how many emails you get you’ll be sure to not to miss the critical ones! Whether you are working on a thesis or a project report, any lengthy document can be cumbersome to work with. 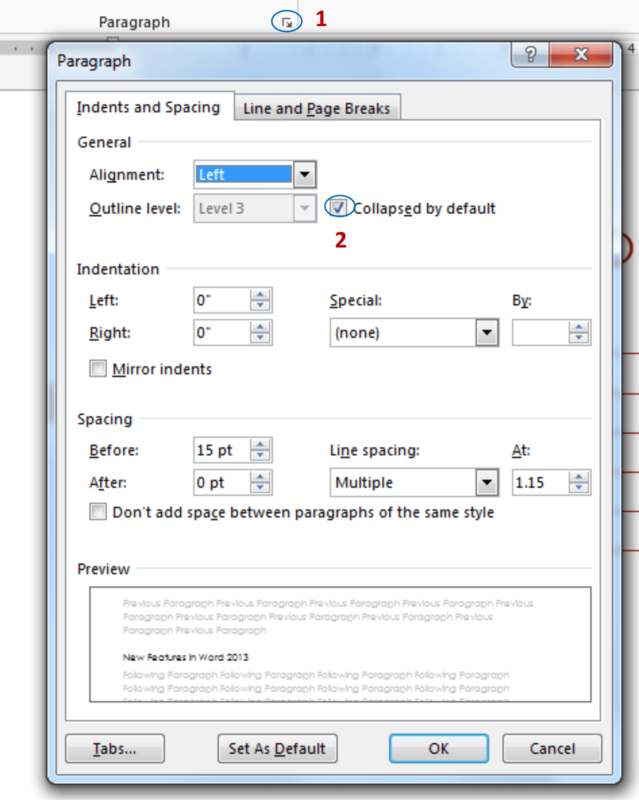 Two new enhancements to Word 2013 that I really find useful are the ability to expand and collapse headings and to set collapse by default. When you hover over a heading within your document you’ll see the triangular Expand/Collapse button. You can open or close that heading just by clicking on the button. 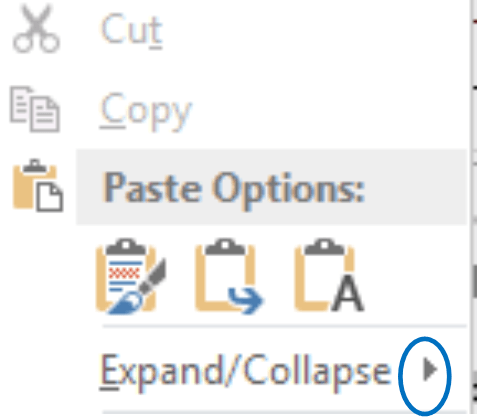 To expand or collapse all the headings in your document, right click a heading and choose an option from the Expand/Collapse menu. If you want, you also have the ability to set the default to open in a collapsed mode. Once you have your cursor placed in a heading, navigate to the Home tab. In the Paragraph section select the Paragraph Settings button (#1). Then, select the Collapsed by default option (#2) and click OK. Viola! You should now have a document that is much easier to work with and looks something like the example below. 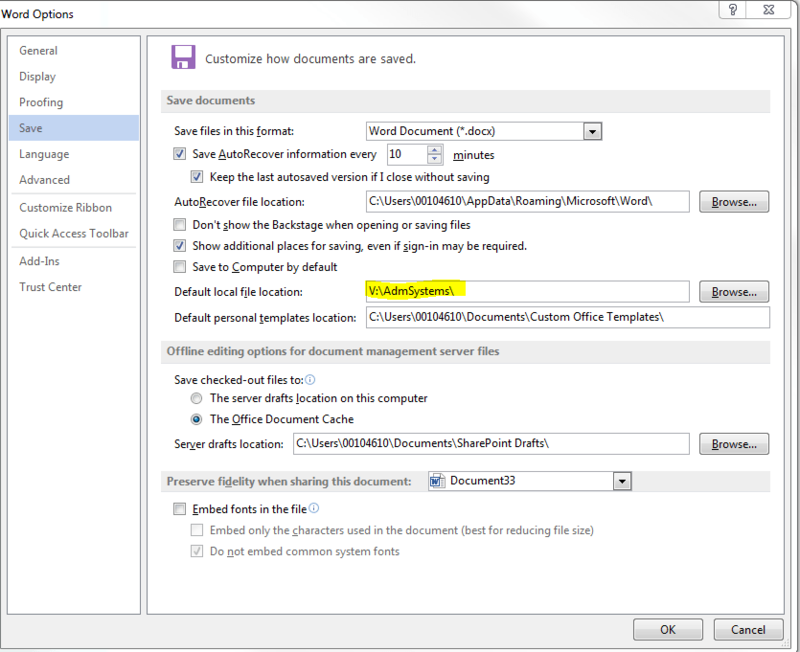 If you would like a tour of Office 2013 and learn a few shortcuts like these, come join my webinar on Sept 26 or Oct 30. Recently I’ve been exploring some of the new features in Office 2013. While there doesn’t seem to be a whole lot of major upgrades to the Office Suite, there are a few changes that I really do like. One thing in particular is the Simple Markup enhancement to the Track Changes feature in Word. If you’ve previously used Track Changes, you know that just opening your document can cause stress, let alone try to collaborate easily in it. Here’s a snapshot of a document I recently worked on in Word 2010. And, boy is that red text seriously making my blood pressure rise! Take a look at the same document in 2013. I can actually read it easily when I first open it. If I want to dig in deeper and look at what was changed, I can. The document still opens with Track Changes on but by default will display in the Simple Markup view. Changes that were previously made are indicated by the red bars on the left. If you click on a bar, you’ll still see the markup. This new format definitely makes it much easier on the eye. This is just one of a variety of new features I’ve been toying with. If you’d be interested in taking a tour of what’s new in Office 2013, consider joining me in one of my upcoming webinars, and I’ll show you a whole lot more!